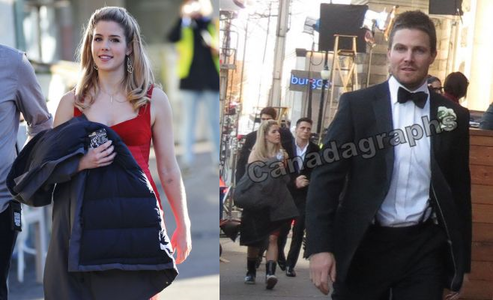 Emily & Stephen ♥ -"I প্রণয় Emily"
(#2) পছন্দ season of অনুষ্ঠান- অ্যারো for Stemily? পছন্দ season of অনুষ্ঠান- অ্যারো for Stemily? অনুরাগী চয়ন: Don't make me choose, I adore both of them. "She's my best friend, I প্রণয় Emily." - Stephen Amell, during নায়ক & Villains অনুরাগী Fest লন্ডন 2018. "Emily and I have always had a really nice chemistry. It’s so easy to work with her, so I think that Oliver and Felicity worked [from the start]. Scorecards don’t have pictures on them, so if আপনি have something on a TV প্রদর্শনী that’s working, আপনি should write towards it." "There was one scene that Oliver and Felicity have that - a lot of things are at stake. As sad as the scene is, it was one of my পছন্দ with Stephen all season because it just felt really intimate. As much as it is a tortured scene, I think it was one of my পছন্দ all বছর just because of the actors that we are and who Stephen is and where our characters have come and how much they প্রণয় each other and how strong our friendship is. Just getting to work together for two hours on the final দিন of shooting the প্রদর্শনী was magical." “I spend a lot of my free time with Stephen, too, so, getting to work with your friend is the dream. You’re super, super blessed if আপনি find yourself in that realm where আপনি get to work and play with the people that genuinely your হৃদয় connects with. And honestly, our friendship is the reason I think they end up together on the প্রদর্শনী because we do প্রণয় each other. "We’re best of বন্ধু now, as I am with almost everyone on the cast. We spend far too much time together." - Stephen Amell answering the প্রশ্ন of how has his relationship with Emily Bett Rickards developed over the years on Larry King. "Well we laugh I mean we’re good friends, it was আরো like for the characters it was such a moment we just wanted to do it justice and really really sort of like take our time with it because it is such a monumental part for the characters, but oh yeah we were laughing and making jokes and I made sure I ate everything he was allergic to and so it was great." - Emily Bett Rickards on স্নেহ চুম্বন Stephen Amell. "He’s very studious and he’s very dedicated to this story as a whole. He understands the unique mind of what happened, and what happened in one episode with this person, this character, and he knows everything very well. He’s very meticulous like that. I think that clarity on the story as a whole, not just season one and not just season two, but being able to see the arc of his character go through is why he’s so good at playing Oliver কুইন and why he’s such a great actor." My Designs, ভান্দার and Enjoy! I'm freaking out again, I got my Die-Hard Medal!!!! a pop quiz question যুক্ত হয়ে ছিল: Which episode of অনুষ্ঠান- অ্যারো were Stephen and Emily filming here? Which episode of অনুষ্ঠান- অ্যারো were Stephen and Emily filming here?